It’s not really clear who exactly this is even for. Glover’s method of engaging in the discourse on race and blackness in America comes with its own baggage. When Atlanta first premiered, Glover said in an interview about the series that he “wanted to show white people [that] you don’t know everything about black culture.” However you want to interpret that sentiment, Glover has long had a fixation on how black people come off to the white gaze. It’s an understandable anxiety, but he’s less concerned about how this fixation distances himself from the actual black people for whom he claims to be making art. “This Is America” only serves to remind you of how much the death of black people—whether captured on dash cam footage or cell phone videos or used in a “message” video—goes viral in our culture to the point of desensitization. You’d be hard pressed to see anyone try and do the same with the deaths of white people. The commentary around the death of black people is often used for effect, in this case as Glover raps, “We just wanna party / Party just for you / We just want the money / Money just for you.” If this feels like an unfair reading, it’s only because Glover deserves that level of skepticism from any discerning viewer. For as much goodwill as Atlanta has garnered him, the shadow of his hangups in regards to black culture and black people still looms. Artists have a right to grow, but still must answer for the things they have said and done in the past. It was just as recently as 2014 that Glover was on the internet decrying “hashtag activism” as an unproductive endeavor in social justice. It’s fair for him to believe that, but it’s also fair to point out that the “This is America” amounts to not much more. Regardless of Glover’s intended statements in his video, it does what a lot of celebrated black art is doing: portraying violence against black people as entertainment for white people. It’s hard to decipher any consistent ideology in Glover’s work. This was true in his comedy and in his music as recently as Because The Internet. It was there in his long, exasperating New Yorker profile. The same guy who complained about black women not liking him and making punchlines out of the Virginia Tech massacre and Trayvon Martin’s death is now making political art about black plight. Maybe his position changed, or maybe he’s simply taking the opportunity to be a beneficiary. In that New Yorker profile, when Glover talks about the teenaged rapper Tay-K—whose single “The Race” was one of the breakout rap hits of the year even as he sat in jail on murder charges— he says, “He’s definitely going to die, and it’s sad.” There is a flippancy and remove in the quote that is interesting in that it reveals a black man who’s numb to death in America, but you can’t help but see that same flippancy in “This Is America.” Maybe his jadedness is the point, but then jadedness can’t also be used as a teaching tool. I don’t fully doubt Glover’s sincerity about violence or even about his blackness, but it’s very clear that Glover has a cool antipathy to both things, and it comes out in this video. 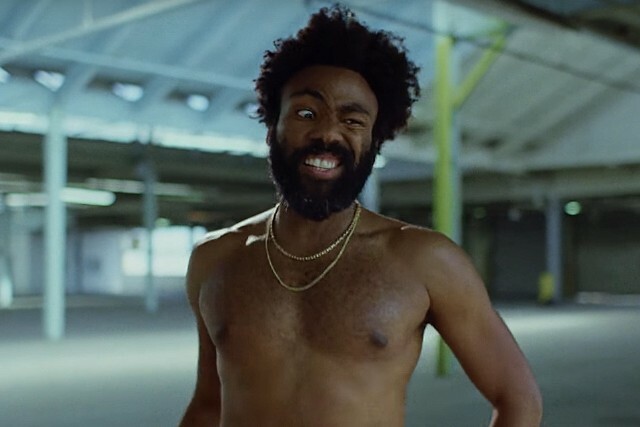 “This Is America” is full of the same social commentary of Spike Lee’s Bamboozled or KMD’s Black Bastards—Jim Crow and minstrelsy allusions to discuss blackness in front of the white gaze and under capitalism’s control—but with not enough self-awareness about what it’s presenting to an audience. The counter is always that it’s necessary to send a message about the epidemic of the murder of black people by showing that violence in unflinching terms. But if that’s true, what does it really say about us that the only way we can create empathy for black lives is by constantly depicting black murder. Furthermore, what does it say about us that the goofy irreverence with which black people are murdered in the video has already been fed into the meme production machine. The reception to “This Is America” has turned the mirror on us and the cynicism of the post-Trump age, where anything remotely aligned with our progressive politics is given unquestioned praise while jokes and memes are treated like a form of resistance. If nothing else, it’s achieved that.